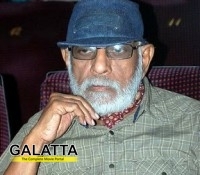 The entire film fraternity mourns the sudden demise of veteran director Balu Mahendra. The iconic director dreamt of achieving big for Tamil films, which he has been working hard for, for many years. But, his wish has remained a dream till now. In an exclusive interview to a leading newspaper, he revealed that producers must take some initiative to build an archive for Tamil films, with government's help. Will his dream be fulfilled atleast after his demise. Let us wait and watch.